Drone technology is already playing an increasing role in the maritime industry for inspection and survey work. This type of technology can offer reduced costs, increased efficiency and improved safety. AkzoNobel Marine Coatings Business, Barrier Group and DroneOps are to collaborate on the development of a new drone specifically for the inspection of ballast water tanks and offshore wind farms. The RECOMMS (Remote Evaluation of Coatings and Corrosion on Offshore Marine Structures and Ships) project will use virtual reality technology and semi-autonomous drones in what they hope will provide more accurate assessment of coating and corrosion in ballast water tank and other difficult to access spaces. The vision is that manual human inspections will be replaced by routine remote drone inspections providing real time data to office based staff and superintendents. The project will bring together experts on coating and corrosion, drone construction, repair and inspections as well as the owners of ship and offshore structures. The drone is completed and launch, is planned for October 2017. 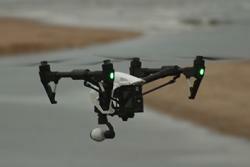 A new guide for the use offshore of unmanned aerial systems (UAS), or drones, has just been published by Oil & Gas UK. It aims to aims to improve the safety and operating standards already adopted on the UK Continental Shelf for production and helicopter flight operations. The guidelines have evolved from lessons learnt in recent years and provide information about best practice, procedures and the certification needed to be compliant with UAS regulations. Mick Borwell, health, safety and environment director with Oil & Gas UK, said that, “A small but increasing number of oil and gas operators are using UAS for inspections predominantly, but also for aerial photography, surveying and security. The Unmanned Aircraft Systems (UAS) Operations Management Standards and Guidelines – Issue 1 2017 (HSE05) is free to Oil & Gas UK member & associate and priced at £60 to non-members. It is available only in PDF format.